This old washboard from the 1930s is bigger than most, measuring 24 inches (2ft) by 12 inches. In very good condition, no cracks, chips or breaks on the ribbed glass, and the wooden frame is solid, the legs and ends of the legs have no water damage. Ideal for hanging on the wall in the laundry room or mud room. One of the best brands back in the 30's, National Washboard Co, the ever popular The Glass King, which was also labeled Top Notch, Soap Saving with a sanitary front drain, licensed by the Mississippi Glass Co. On the other side it is labeled National Washboard Co, No 860, Made in USA, Chicago, Saginaw and Memphis. 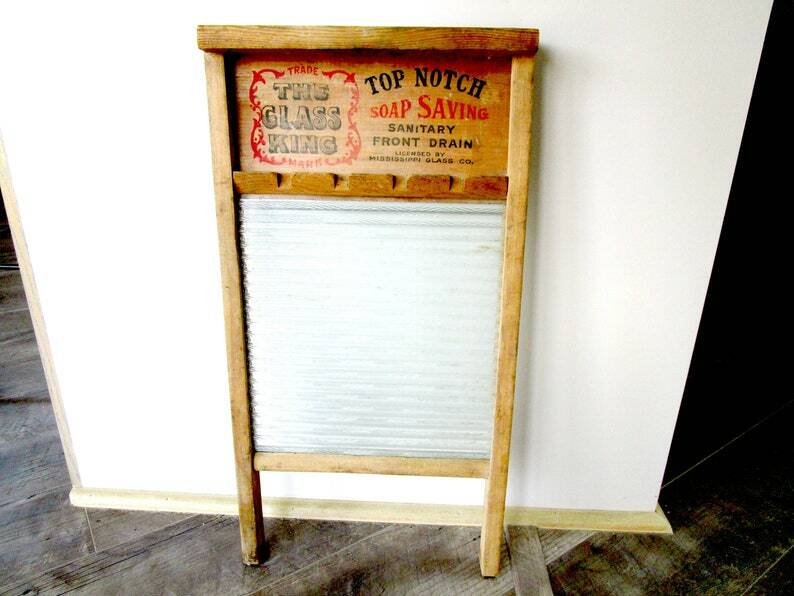 You will not be disappointed with this washboard, clean and ready to hang. Munising Wooden Dough Bowl, Flamingo Dancer, Spanish Dancer, Hand Painted Bowl, Wood Bowl, Munising Bowl, 11 Inch Diam.